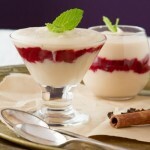 Dairy-free, low-fat dessert made with blood orange sauce and surrounded in a dairy-free lemon cream. Completely remove the rind from the blood oranges with a sharp knife. Then, break into it’s natural segments and remove the flesh from the skin. Once you’ve removed the flesh from the skin, place in a small saucepan and continue with remaining segments. Add remaining sauce ingredients to the saucepan and heat on medium-low until it comes to a simmer. Cook for 8-10 minutes, stirring frequently, until apple pieces are soft. Remove from heat, mash with a fork or potato masher, remove cinnamon sticks and cloves and set aside to cool completely. Meanwhile, add dairy-free lemon cream ingredients into the bowl of your food processor or blender. Begin with 1 teaspoon of dairy-free milk. Blend until smooth. If the cream needs a bit of thinning out, add extra milk. The consistency will vary drastically depending on what type of cooked beans you use. Every brand seems to have a different consistency. For my homemade batch of cooked beans, I used 1 tablespoon of non-dairy milk. 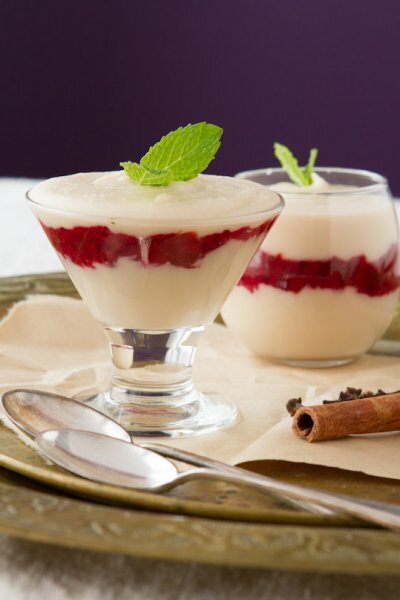 Once the sauce is cooled, grab two small cups; I used a tea light candle holder for one of my parfaits, and add a layer of cream to the bottom of the cup. Follow with the sauce, then top it off with cream. Smooth out the layers as you go. Serve immediately, topping it off with a sprig of mint, or allow to chill for a couple of hours before serving.